The Future of E-commerce: New Data from Ovum - Read today! Ever wondered what e-commerce will look like 10 years from now? Consulting firm Ovum is giving us a peek into the future with their e-commerce forecast through 2026, which answers questions about what might change within the online marketplace, how technology may impact the industry, and what future consumers will likely expect. Take a look at some of the key takeaways of this research to better understand where e-commerce is moving and to prepare yourself for the future. Today, e-commerce customers, for the most part, expect good deals and quick delivery. However, a growing number of online consumers (largely millennials) are already beginning to shift expectations and raise the bar. They want unique products that can’t be found in mass-retail stores and 24/7 access to support, just to name a few of their burgeoning desires. Ovum predicts that by 2026, the bar will be even higher for e-commerce merchants. Shoppers will expect things like seamless experiences across devices and touchpoints, instant access to support, fast turnaround of orders, personalized experiences, and free or low-cost delivery — just to name a few. As technology adds more touchpoints to the shopping journey (think mobile, desktop, in-store, connected devices, etc. ), the straight line path to conversion will become a thing of the past. 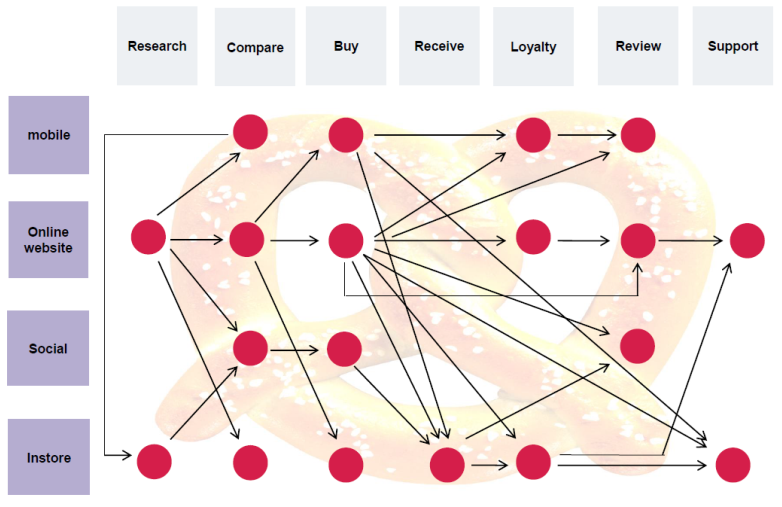 Instead, complex shopping journeys that span various experiences and devices will be more pretzel-shaped. For retailers, that means figuring out how to measure which avenues are driving the highest ROI and optimizing a much more sophisticated path to purchase. Buyers of the future will also likely expect online merchants to tap into the sharing economy as well. Smart retailers will need to learn to leverage partnerships and sharing opportunities, such as retailers like H&M are already doing with their donations of returned products to charities. This presents an opportunity for greater sustainability efforts, less waste, and more moments of giving — all of which is a positive message for consumers to hear. With big e-commerce brands like Amazon testing out the physical retail model (their Amazon Books and Amazon Go stores, for example), in the future, we can expect to see the line between online and offline points of purchase become more seamless and intertwined for retailers large and small. Let’s look at some of the key ways this may manifest itself. Rather than an online-physical distinction, retail will like to move towards an experience fulfillment model in which the customer shopping experience takes precedence over a range of products. This could also mean more pop-up stores for more dynamic, interactive shopping experiences, too. As manufacturers seek more control over how their products are displayed and sold, they may be able to exercise their power more in the future — especially in the electrical devices marketplace — by favoriting only sites that meet their requirements. Retails who approach the experience from a tech-favorable mindset that works seamlessly across channels will likely outpace the competition, as they’ll be empowering shoppers to shop when, where, and how they want. This does require some investment in tech and logistics, so smaller online retailers may struggle to scale up their operations and meet this growing demand. As smartphones with larger screens become the norm, we can continue to see more and more shoppers using mobile devices for e-commerce transactions. Retailers who optimize their websites and processes with a mobile-first mentality will best capitalize on these shifts in buying habits. What else does this mean for mobile commerce? Looking ahead, it’s likely that geolocation will be leveraged by retailers looking to deliver contextual marketing to customers. The adaptation period for hyperlocal commerce may be slow, and retailers must use this data responsibly without overstepping the bounds of privacy. However, used conservatively, this type of data can help shoppers get the best possible deals nearby — and creates opportunities for customer engagement on a whole new level. Mobile payment will most likely be mainstream by 2026 but will have evolved thanks to improvements in tech. This means most payment formats across the board may shift to be more device-based rather than depend on physical cards. Cash will not be eradicated, but will likely be used in much lower frequency. With mobile-enabled loyalty programs, interactivity and engagement can be optimized in ways that traditional methods have not been able to master. This will empower consumers to load multiple digital reward cards into a mobile wallet, which can then tie into game-like elements that boost use amongst shoppers. Mobile advertising will continue on an upward trajectory — and spending will most certainly increase within this medium. However, native applications will likely be replaced by more intuitive approaches that help retailers select the most relevant channel to accomplish advertising goals. By 2026, we’ll likely live in a hyper-connected world, with more than 660 million machine-to-machine connections around the world. These connections will make retail more efficient and effective, and will also make advertising more targeted and personalized than ever before. If IoT payment and commerce applications don’t have a hyper-relevant purpose for the consumer, they’re likely to be seen as gimmicks — and because of this — Ovum remains skeptical about their use and adoption on a mass-scale. Over-connectivity could cause frustration for shoppers who feel a lack of control over their environment. Wearables may be a solid source of detailed data — which enables more accurate advertising through mobile mediums. However, privacy infringement will be a major concern for shoppers — so retailers will have to walk a fine line when targeting consumers via wearable tech. Augmented reality (AR) will likely have the most impact on the e-commerce retail experience, as it allows merchants to showcase enhanced information or graphics that blur the lines between physical and digital worlds. Keep in mind that AR is different from virtual reality, which is a fully immersive experience. AR will help enhance the experience by allowing shoppers to view products in their homes, which can then immediately be purchased. Be flexible, train often. E-commerce retailers will have to be flexible and accommodate the many changes ahead. This process is made easier through constant learning, training, and innovation — so it’s essential to embrace a bit of a learning curve. Leverage segmentation. By 2026, segmentation may no longer be appropriate for consumers who move seamlessly between segments. Instead, more advanced, creative models will be needed that embrace this fluidity while still delivering relevant, personalized experiences. Know the limits of personalization. Go too far with personalization in the future, and you might ruin your profit margins. Keep in mind that cost-efficiency and scalability can be destroyed when you try to create a product that’s too personalized. Retailers will need to strike a balance between personalization and mass production. Study your shoppers. Online retailers that will succeed in the future are the ones who know and understand their customers — from marketing preferences to buying habits and beyond. Use analytics to study and deeply understand what your shoppers need and want from you. Refine your brand. Finally, there’s the element of branding. Knowing who you are and what you represent as a brand will help you establish a unique, memorable angle within this evolving marketplace. Strive to constantly refine your branding elements, and you’ll maintain a lasting, relevant impression in a hectic online market. 2026 is a long time from now, but that’s no reason to put off your preparation. Get a head start with your plans for the future, and think about what you’ll do to stand out against your competition.